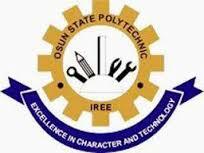 Osun State Polytechnic Iree [OSPOLY] Daily Part-Time (DPT) Admission List for 2018/2019 Academic Session, How to Check OSPOLY DPT Admission List 2018/2019. This is to inform all the candidates that applied for the Osun State Polytechnic, Iree Daily Part-Time (DPT) programme admission that the admission list has been released for 2018/2019 academic session. Osun State Polytechnic, Iree DPT ADMISSION NOTIFICATION CARD is available at OSPOLY Microfinance Bank, Iree and UBA, Iree Branch or its branches in Ayetoro, Osogbo or Isokun Round about, Ilesa. Click here to Check Admission Status. NOTE: The Admission Application Form is still available for sale at the aforementioned bank at a sum of Ten Thousand Naira .